The great value, stylish Polar Patisserie Showcase 1800mm features a compact contemporary design and high capacity. Ideal for the presentation of cakes and pastries in catering establishments and retail outlets, this Polar display fridge measures 1800mm wide, is finished in stainless steel and includes a powerful fan cooling system, triple-glazed safety glass, automatic defrost and heavy duty castors for manoeuvrability. Also comes supplied with adjustable shelves for more versatile storage options. Ensure you maintain a 20cm gap between the machine itself and the wall to allow the ventilation system to function effectively. This unit it also not suitable for use directly next to a heat source. Please note: This unit is not suitable for use in a mobile environment, including mobile catering vehicles. We ship by road express within 48 hours of purchase which can take 1 ~ 10 days to arrive to you, depending on your location. Returns under warranty are to be sent to National Kitchen Equipment 2/74 Township Drive Burleigh QLD 4220 at the senders cost unless otherwise stated. Refunds for change of mind or you made an incorrect purchase incurs a 20% restocking fee of the total purchase price of the item. All products come with a minimum of One Year Limited Warranty unless otherwise stated. National Kitchen Equipment ("National Kitchen Equipment") warrants only to the original purchaser of this product from an National Kitchen Equipment – authorised reseller or distributor that this product will be free from defects in material and workmanship under normal use and service for one year after date of purchase. National Kitchen Equipment reserves the right, before having any obligation under this limited warranty, to inspect the damaged National Kitchen Equipment product, and all costs of shipping the National Kitchen Equipment product to National Kitchen Equipment for inspection shall be borne solely by the purchaser. In order to recover under this limited warranty, Purchaser must make claim to National Kitchen Equipment within 30 days of occurrence, and must present acceptable proof of original ownership (such as original receipt) for the product. National Kitchen Equipment at its option, shall repair, replace or refund the defective product covered by this warranty in the first 30 Days of purchase only. If a refund is given it will be returned by the same method of payment only. National Kitchen Equipment will replace parts only for the remaining 11 months. Please retain the dated sales receipt as evidence of the original purchaser's date of purchase. You will need it for any warranty service. In order to keep this limited warranty in effect, the product must have been handled and used as prescribed in the instructions accompanying this warranty. This limited warranty does not cover any damage due to accident, misuse, abuse or negligence. This limited warranty does not cover consumables such as seals, blades, bulbs, heating elements and the like. This limited warranty is valid only if the product is used with the equipment specified on the product box. Please check product box for details or call National Kitchen Equipment technical support. This limited warranty is non-transferable and does not apply to any purchaser who bought the product from a reseller or distributor not authorised by National Kitchen Equipment, including but not limited to purchases from internet auction sites. 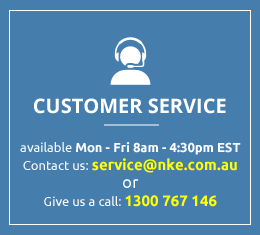 Contact National Kitchen Equipment at www.nke.com.au or at the technical support number 1300 767146. LIMITATION OF LIABILITY REPAIR OR REPLACMENT OF THIS PRODUCT ON RETURN TO US WITHIN 12 MONTHS OR PARTS ONLY IF NOT RETURNED TO US, AS PROVIDED HEREIN, IS YOUR EXCLUSIVE REMEDY.